In this post you will learn how to enable experimental features of Google Chrome. 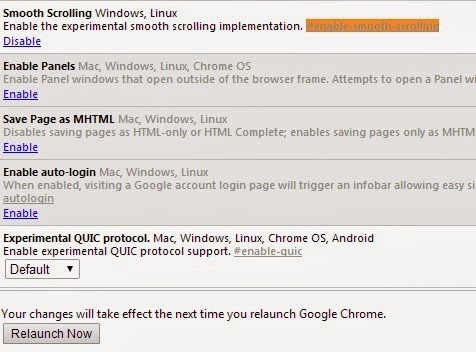 So get ready to know the secret trick to enable smooth scroll in Google Chrome browser. I am posting a new blog after very long day in this blog. Previously I have shared many Blogger blog tricks, hacking tricks and many of the interesting tricks that you may need to know about. From today I will also keep you updated with latest Google Chrome and Mozilla Firefox tricks. I found that many of the secret tricks are very cool and you'll probably want to know about all those tricks. With all those tricks I am sure you will be able to browse the web in more easy way. Getting curious to know the today's trick, than read the post below. Today I will show you how to enable smooth scrolling in Chrome browser without the use of any extension or plugin. This is experimental feature and therefore it is not enabled by default. I will show you you how to enable some of these secret feature that you will really like. Since smooth scrolling in Google Chrome is in its developing stage, so it may change at any time and also, it can be removed later. Let's not waste more time. Read the below given steps carefully to know the secret trick to enable smooth scrolling in your browser. At first, open your Google chrome browser and than type the following URL in your browsers URL bar. By going to the above address you'll go inside the secret tab of Google Chrome browser that is not navigable by default for normal users. Here, in this tab you'll see several experimental features that's not enabled for normal users. We want to know how to enable smooth scrolling in our Chrome browser. To enable this feature, look for the paragraph that says "smooth scrolling". Still, you don't know where is smooth scrolling feature than Press CTRL+F at the same time to open the search box. Now type #enable-smooth-scrolling in the search box. Now you'll see the para that looks something like the image given below. Look the image carefully to know the trick. After finding the Smooth Scrolling tab click on enable button to enable this secret trick in your Google Chrome browser. After enabling the smooth scrolling feature click on the "Relaunch Now" button so that the new settings can take effect. See the image given below to know where is the relaunch now button. That's all. Look for more interesting tricks in the experimental tab by going to the chrome://flags address. If you face difficulty after enabling the experimental features than click on the "Reset all to Default" button to go the previous default Chrome features. You know you can also change the font of all the website that you visit with the help of Font Changer extension for Chrome. Did you know that you can see the saved password in your Mozilla Firefox browser, if not click on the link to know more about this trick. For more tricks keep visiting. If you liked this trick than take a few second to share it to your friends or hit the like button below with your favorite social networking sites.